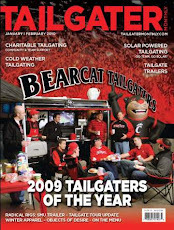 BearcatTailgater.com: This Week's Tailgate.... Beat Pitt! COME EARLY, BE LOUD, WEAR RED! Join the Bearcat Tailgate Crew this Saturday before the BIGGEST UC FOOTBALL GAME EVER! We will kick-off the festivities around 2pm (following the basketball game). The Ultimate Tailgate Trailer will be pumping the finest tunes and the TV will be showing all of the best games of the day. The brisk weather is no match for the Tailgate Crew as we will have a blazin' fire pit to keep everyone warm! In celebration of the upcoming Holiday, this week's theme is THANKSGIVING! The Crew will be fryin' up a couple birds and giving thanks to BK and the Bearcats for another exciting Bearcat Football season! We are expecting a large crowd as we cheer on the CATS to a Big East Championship. COME EARLY, TAILGATE HARD, GIVE THANKS, BE LOUD, AND WEAR RED. We will start to tear down the tailgate around 6:15pm so we can pack Nippert and cheer on our Bearcats as they run out of the tunnel prior to kick-off. Tailgate Location: Schiel School Parking Lot located on the corner of Short Vine and W. Daniels (across the street from Daniels Pub & Sigma Sigma) Click Here for a map of our tailgate location. Post a comment and let us know if you will be there! I will be there ready to put a few "beer coats" on to keep me warm during the game! Definitely will try to make it over there! If not I'll see you at Huck after the game. We'll be there.. go Bearcats!!! Allison and I are ready for a BEARCAT SMACKDOWN over PITT.